So I was sitting there feeling sorry for myself when I suddenly realized that, unlike “vacivity”, I was unlikely to face extinction in the next few years. Lexicographers drop words like this from dictionaries all the time, without ever giving thought to the majestic history embodied in a few syllables. They just jettison them with no thought at all to their storied past, Olympian grandeur and opulent charm. Oxford University Press has a grandiose scheme to save “vacivity” and other words shrouded in the hoary mists of time. The Save the Words campaign accepts the adoption of a single word by a single person to wrest it from the dustbin of history, presumably by (enshrining it on a website somewhere) by making it part of his/her daily vocabulary, thus restoring the lustre of past glory. Fair warning, Oxford University Press uses Flash, so I haven’t been there in person. Not that I need help in taking in stray anachronisms and making them my own. though many, fall into four main categories. I suggest reading them in this order. You local library likely has several of them and can get more. All are available as audiobooks and in paperback. I liked the watch novels best, but the witches were pretty good as well, and—oh, hell, just read them all. You won’t be sorry. I promise. Terry Pratchett himself is a modest, unassuming fellow who has recently been diagnosed with early-onset Alzheimer’s disease, and knighted the following year. I feel like an underachiever. Posted by stuffilikenet in Books, Toys. Cdex is a freeware CD ripper which will allow you to copy your CDs to your MP3 player will relatively little fuss. It has no adware and no begware. It is somewhat customizable, can use CDDB if you wish, supports the license-free, more responsive OGG format and is otherwise “mostly harmless”. Like most software, it pays to take a few minutes to figure out how to use it before plunging right in. You could save yourself a lot of time renaming ripped MP3s, for example. Of course, it should only be used for CDs you already legally own, not those taken from the public library or borrowed from friends (speaking of which, when legally copying multi-CD sets, save the results to different directories each time, or the track numbers may overwrite each other). Copying your own property for your own use is still legal, no matter what the RIAA says. "Of all the offspring of Time, Error is the most ancient, and is so old and familiar an acquaintance, that Truth, when discovered, comes upon most of us like an intruder, and meets the intruder’s welcome." Charles Mackay, the author of this quote wrote a wonderful book about, well, Extraordinary Popular Delusions and the Madness of Crowds. In it he recounts several economic bubbles (and probably exaggerates them), the swirl of insanity around witch hunts, strange philosophies and general nuttiness that men are heir to. The link above goes to The Gutenberg Project, but I liked this book so well I bought my own portable copy of Extraordinary Popular Delusions and the Madness of Crowds. Choose one, but do read this. It will keep you sober when all others are drunk with enthusiasms. Free Zone by Charles Platt is a delightful science fiction fantasy novel set in a parallel universe where Los Angeles is a chaotic dictatorship with a libertarian Free Zone in the middle of it. We know it’s an alternate universe because ours is referenced in it by the super-intelligent robot from the future who stumbles upon it while threading time looking for a better place for the combat-grrl president of the Free Zone and her geek boyfriend, his friends. This is because the Free Zone is being invaded by hyper-intelligent dogs, aliens, dinosaurs and subterranean troglodytes all at about the same time. Fortunately, the Hell’s Angels are there to save L.A. from these lesser terrors. This novel has an alphabetical listing of the seventy-one science fiction themes it touches upon in the back of the book. I bought it for that reason alone. The SanDisk Sansa E-series MP3 players represent a delightfully inexpensive yet thoroughly useful bit of engineering. The 2Gig version of these players (the Sansa E250 2GB MP3 Player) and the 4Gig version (the Sansa E260 4GB MP3 Player) can be had very cheaply at buy.com on special sale or on Amazon.com most of the time, and are easily expandable by means of the 2GB MicroSD cards which they support. They have an FM tuner, can record FM on the fly and also take dictation (see my earlier post on the value of Dragon Naturally Speaking transcription software). But wait, there’s more: the operating system of these players can be replaced by a delightful bit of software known as RockBox. RockBox can allow Sansa players to take the 8GB microSDHC cards with capacities up to 8Gig or more. RockBox has other useful properties as well, but this alone makes it worth the trouble of adding to your player. RockBox is installed alongside your operating system, so it doesn’t replace it. You can boot back to the standard system if you wish. I shouldn’t tell anyone about this wonderful book. It is full of the most horrible, immoral, unethical and probably illegal methods of revenge, and little stories about people who exacted revenge by said methods. Don’t ever, ever buy this book. Spite, Malice, and Revenge are fun to read about, but should never be exacted by enlightened persons. I would never, ever use anything this book recommends. And neither should you. I’m a closeted history geek. My favorite books in all my readings are The Story of Civilization by Will & Ariel Durant, a multi-volume compendium of all that is noble (and much that is ignoble) in recorded history, and is actually a breezy read, if a bit long; most of the eleven volumes in this series are in excess of a thousand pages, and took him years to write…each (he apologizes for his shortcomings charmingly in each volume after volume three, explaining that he will be dead before he can finish to his satisfaction). These eleven volumes took forty years. Project Gutenberg is one of the most wonderful things in the web. It’s a huge collection of books in downloadable formats. Pretty much every classic work is there (100,000 titles between the Project and its friends) and many newer books (I never would have read Don Quixote without them, nor Arabian Nights). Audiobooks are also available; lots of Andre Norton, for example. I can’t say enough about this wonderful resource, except to suggest a trivially small donation from each person would be very helpful; say, one penny per book. They take PayPal. Graffiti is a filthy nuisance that causes decay to otherwise nice modest neighborhoods, like mine. The taggers are usually unemployed and probably unemployable youth. Both art and artist are unwelcome pretty much anywhere and I have a solution. Report and arrest them. The penalty for conviction shall be a full-time job (for those out of high school) or part-time (for those in high school) cleaning graffiti, starting in their own neighborhoods. The duration of the job shall be one year. During that time, they will receive minimum wages if they show up on time and work responsibly and they get to wear their own clothes. If they fail to show up on time and work responsibly, they get no pay and wear bright orange jumpsuits with the local correctional facilities name emblazoned in large letters. I figure they will know how to work by the time a year has passed, or will at least have some idea of what to look forward to if they don’t learn to work. And they will have gotten used to a steady paycheck and getting up at a decent hour. Not much of a benefit to them, but at least society gets some labor directed at a social ill. And I haven’t seen anyone suggest a better way. 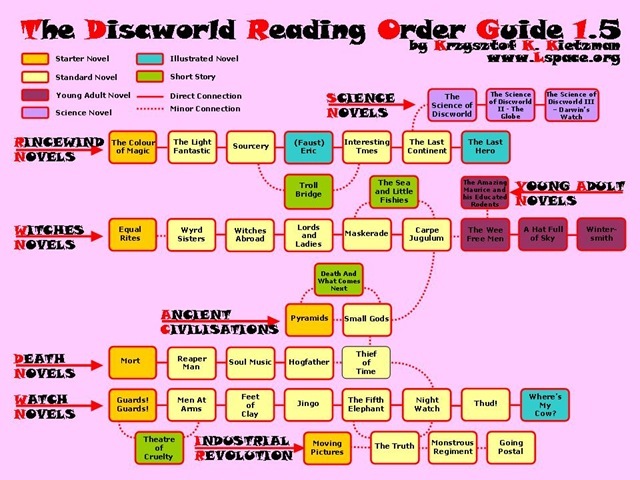 Posted by stuffilikenet in Awesome, Books, Brilliant words, Science, Webcomics. Something I really love is (are?) web comics. Dozens of fine artists and writers seem to be expressing themselves in delightful profusion and I find my list of daily reading material grows every week as I find more of them. I would be hard-pressed to express a particular favorite except Girl Genius. I found this on BoingBoing.net, the finest single website in the universe. Click on the Awesome Dragon of Cake to go the Flickr site which houses it. NASA is taking a survey to help determine goals and policy for the incoming future. Go there and express yourself. My personal comments are shown below. Note that few of these involve specific projects. The projects themselves will be haggled over by politicians endlessly, no doubt. The only critical pieces of tech that must be built and maintained are weather satellites, GPS satellites, spy satellites and research satellites in earth studies. And does anyone believe that Hubble wasn’t a great investment? The Webb telescope should definitely be built and deployed, with an eye to longevity. Who among us hasn’t wanted to let go with a volley of machine-gun fire at our co-workers at least once? I know I’m not alone (and let’s not even talk about the kids). 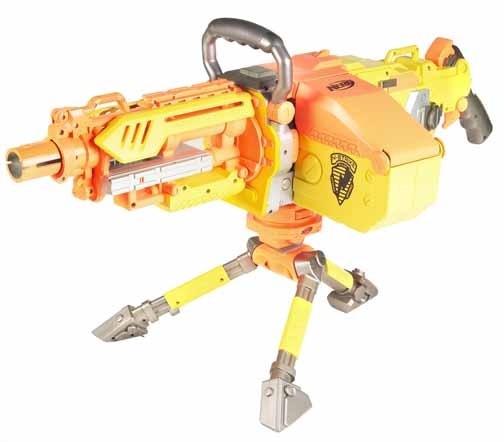 Fortunately, Hasbro has found a pleasant way to meet this need without costly bullets or heavy, metal encumbrances: the Nerf N-Strike Vulcan EBF-25 Blaster – (in soothing Yellow). It’s a fully-automatic Nerf gun. You can’t put your eye out without really, really trying. This delightful toy (guaranteed to keep your geek children playing happily for hours) comes with a 25-bolt belt, a tripod and an approximate 3 rounds a second rate of fire. Seriously, is there any reason to have an inkjet printer in your home anymore? Not when the price of refills is $35, and the inkjets clog if not used daily. My family converted to laser printers last year and we have not been sorry. I have replaced one toner cartridge in that time, versus two or three inkjet refills in a similar time period. I recommend the Brother HL-2170w 23ppm Laser Printer with Wireless & Wired Network Interfaces, which is currently on sale at Amazon (follow the link to buy it and I get a small bit of change—unless you are a friend or relative: verboten!). Dirt cheap at US$106, and the refills are not bad, either: Brother TN330 Black Toner Cartridge for $US32.99. Please note that, while the price is similar, the toner lasts much longer than inkjet refills under normal conditions. About three times longer, in my recent experience. As a bonus, this sucker is networked so no one computer has to be on to print to it. Check it out. 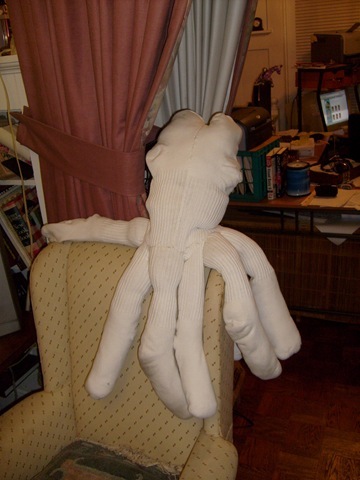 Posted by stuffilikenet in Awesome, Octopus, Toys. The finished product will have Velcro dots within the suckers and should stick to my sweater. I will take it for a walk and call it Octavian, after my second-favorite Emperor. Windows Live Writer is a nifty blogging tool from (of all companies) MicroSoft. It can be made to work very well with WordPress.com, which is why I’m writing about it now. I have used it in the last post, and it worked pretty well, without anything like an elaborate setup. My sole complaint with Live Writer is merely that it has this strange unnecessary graphic occupying the top portion of the edit screen. No explanation, and no obvious way to turn it off. Small complaint, though; I am enjoying it otherwise. it works as well as any other web-editing tool, and better than some. I will be testing out it’s graphics- and media-insertion tools in future posts. Stay tuned. Dragon NaturallySpeaking 9 Preferred [OLD VERSION] is a dictation software suite with 99% accuracy after a very short training period. I am told it gets even better with more training, but I only had time for about half an hour. You can probably tell I don’t have much time for blogging either, but I do have time to dictate my thoughts into an MP3 player (more on that in future) during my commute. Dragon can extract my words with pretty fair accuracy, which is enough for me to have something to work with later, since I edit quickly. I recommend it highly. I am told that Vista has nearly equivalent dictation abilities, although the ability to grab a wav file or MP3 and transcribe it isn’t something I’m sure Vista supports. Exciting update: Dragon NaturallySpeaking 10 Preferred ( )is even cheaper, and still supports dictation on different devices like your iPod , iPhone , Sansa Fuze 4 GB Video MP3 Player or whatever. Exciting Update 2: Dragon Dictation makes a free app for phones; just speak and Dragon Dictation transcribes. You can send the written memo as a text or e-mail, or post it to Facebook or Twitter. Dragon Dictation is a free-standing app for iPhone, but it is built into Nuance’s Android app called FlexT9, and for BlackBerry there’s a comparable Dragon for E-Mail app. The Siri software on the iPhone 4S, the newest model, also does voice-to-text. These are the cheapest methods of getting dictation applications portably, but if you want it on your computer, use the links above to buy it, as I get a tiny commission from Amazon. EXCITING UPDATE 3: Dragon Naturally Speaking Premium12 apparently has had a nice boost in accuracy and guesswork algorithms but is like US$160 or so. The latest Dragon NaturallySpeaking Premium 11, [Old Version] is more affordable at US$59.99. This one still does file transcription (record from somewhere, take home and transcribe on your computer). They claim 99% recognition out of the box! EXCITING UPDATE 4: I really should keep up with these things. The current old version is 13. It can be had for as little to $50. Beginnings are about the hardest thing of all. 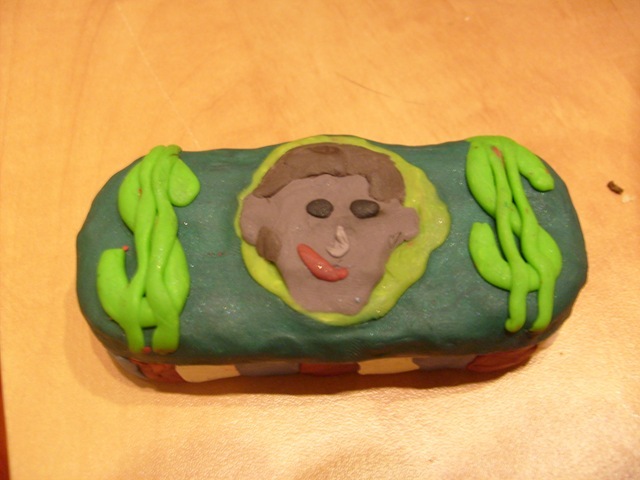 This blog begins here on the WordPress site and hopes one day to become a real live boy. Meantime, as promised above, only positive posting will be found here of stuff I like… like WordPress.com, where we currently are. They have a bunch of helpful templates for folks like me who do know how to slap a website together, but don’t want to put one together over a day, but during a short lunch break (I’m sure the effort shows). WordPress has dozens of helpful widgets for webmaster and readers alike, some of which I will be activating and using here, and describing in detail as I go. I did promise only to write about stuff I like, so only the widgets I find useful will be described.